MachNation is announcing MIT-E 2.0, an enhanced suite of products and enterprise services from MachNation’s unique IoT platform test lab. MIT-E is the industry’s only hands-on IoT platform benchmarking environment used by enterprises worldwide to guide IoT platform purchasing decisions based on hands-on tests of IoT platform capabilities and usability. 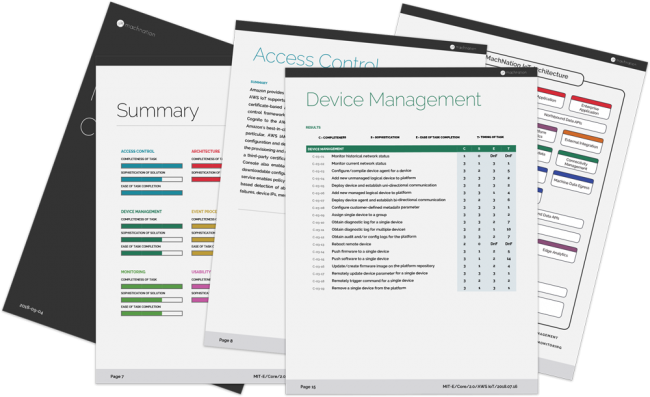 MIT-E Complete has been expanded to include 110 hands-on workflows (a 57% increase) that evaluate an IoT platform’s capabilities and usability in the following 10 areas: access control, analytics, architecture, data management, device management, edge, event processing, external integration, monitoring, and usability. MachNation continues to offer MIT-E Complete, a highly acclaimed set of reports covering hands-on IoT platform testing of Altizon, Amazon, Bosch, ClearBlade, GE, Google, IBM, Litmus Automation, Losant, Microsoft, PTC, Sierra Wireless, SiteWhere, Software AG, and ThingsBoard. Are you an IoT platform vendor? Get your platform added to MIT-E Complete.